Displaying my children's art in my home has always been important to me, but lately it has become increasingly important. Although I don't want my house decorated in plastic and primary colors, I do want it to be a place where children are welcome and where it is readily apparent that young people live and are loved. 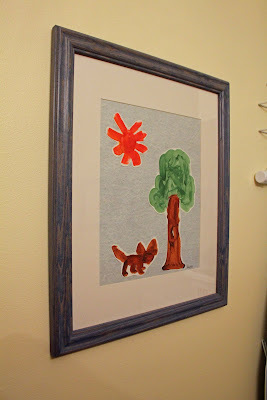 To me, displaying my children's art is one of the best ways to do this. 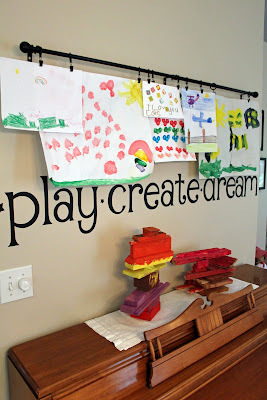 The refrigerator is a great place to start displaying those crayon creations, but I think it is important to show children that their artwork is important enough to showcase elsewhere in the house. 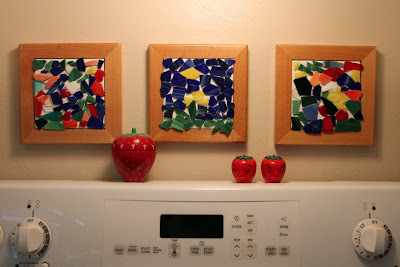 Today I went around the first floor of the house and snapped a few pictures of where my children's artwork is displayed--other than the refrigerator! The first location is in the playroom (aka the room that used to be the dining room!). I've posted about this rod before--it is so easy to clip new artwork onto the rings. Oh, and those wood sculptures were made by my little boy. He is so proud of them--the red one is a fire station and he's still deciding on the other one. They're not out on display all the time, but they do make appearances. 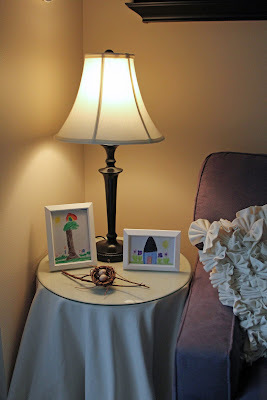 I recently needed a little "something" for this side table in my living room, so I cut some cardstock in the size of these frames and gave one piece to each of my children and had them go to work. My five year old opted to draw a tree with a sunshine, rainbow, and flowers. My seven year old drew a picture of our blue house with a red door. They love seeing their artwork framed and I think their sweet drawings are the perfect "something" for my table. Whoever designed this house opted to combine the laundry room and powder room--not a good combo in my book. At any rate, this artwork by my little boy is over the commode, but he doesn't mind one bit. 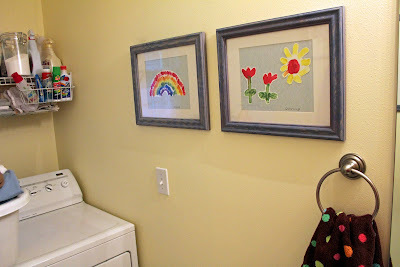 I love having these cheery pieces in there because it brightens up a room I spend a lot of time in! His fingerprint rainbow and sweet tulips warm my heart. 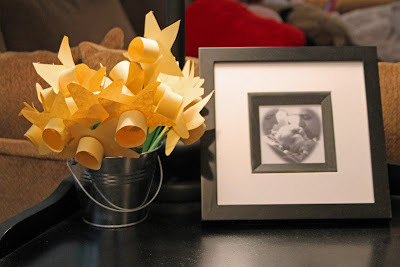 Summer hasn't really arrived here, so I still have this spring bucket of daffodils that my children made two years ago--I love it! The jagged scissor cuts on the daffodils make me smile every time I see them. In the kitchen these tiles are above my stove. My children made these when they were almost three and almost five--such a simple project that has a lot of impact. The glass is tumbled (so no sharp edges) and glued to plain tiles with white glue. Then the tiles are mounted into frames. Simple! It isn't just about displaying my children's artwork, it is about incorporating it into our home. I don't want our home's decor to be all about what "I" want--we are a family. Love your kids' artwork. I, too, have lots displayed! It really makes a house a home! Wow! 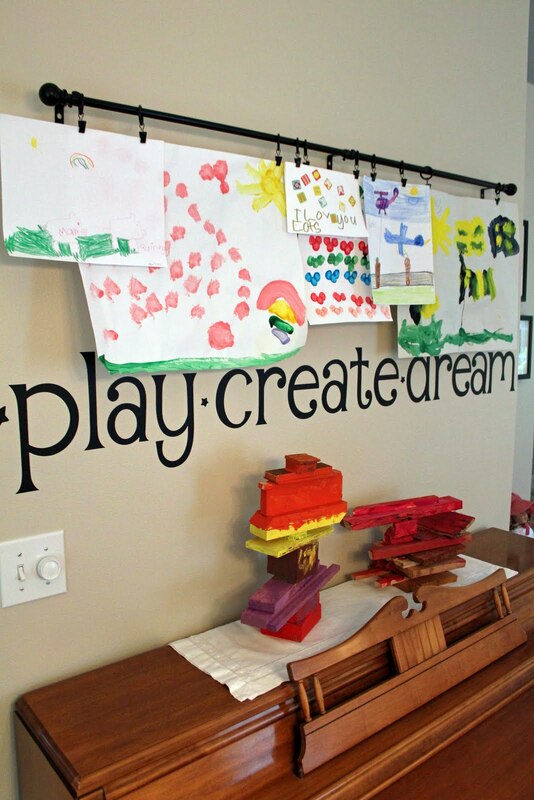 Those are some really good ideas on how to showcase your children's artwork. I'm the same way and want people to see their acomplishments in creativity. I've actually scanned or taken pictures of their artwork and put them onto our digital picture frame because I hate keeping so much paper clutter. I keep my favorites in a folder for when they are older, but most drawings and paintings end up on the digital picture frame. 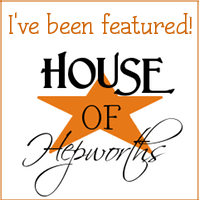 Thanks for stopping by my blog and commenting. Hope you have a great day! Beautiful ideas! I was wondering exactly what kind of clips you used on the rod? Thanks in advance! They are just ring clips from the drapery department at Target. You can buy them anywhere that sells drapery supplies--JoAnn Fabrics, Bed Bath and Beyond, Target, etc. Were the tumbled rocks/glass bits in a kit? I love the curtain rod idea and hung one going up our steps that matches our birdcage look on our banister. However,I have found that the clips leave lines on the artwork. Any thoughts here? New Shoes or Teva makes Mary Janes ?